Anneke Rood boldly broke through personal boundaries to climb Table Mountain. We’re so proud of our students for making the trek! Hiking Table Mountain has been the highlight of my time here in Cape Town. It’s not my favorite because of the view, or the idea of “conquering” one of the seven wonders, but because I made some of my best friends on the hike and I pushed myself to do something I never thought possible. I was born with 4 life-threatening heart defects. I’ve had multiple heart surgeries and for the past 5 years I’ve been afraid to do anything active and physically demanding. 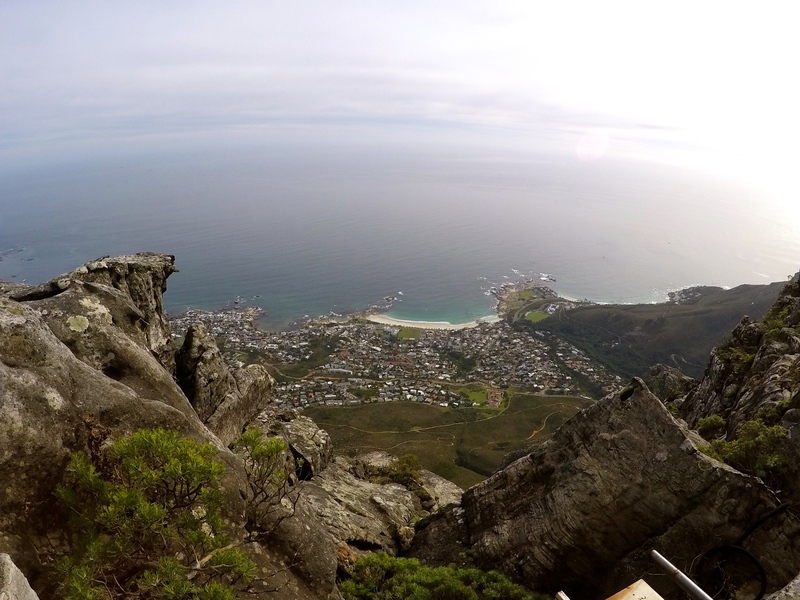 Strangely, when I came to Cape Town, climbing Table Mountain never felt like an option… it was something I had to do. I knew it would be hard, I knew it would be uncomfortable but I also knew that I would be proud when I reached the top. When we were about to start our climb, I looked up to the top and thought it didn’t look that bad, I could do it. So when we got up about 30 meters and I had already taken off two layers of clothing and was sweating like a pig, I felt pretty ignorant. I fell back from my roommates pretty quickly and had to take frequent breaks to catch my breath. I found myself surrounded by 4 girls about a quarter of the way up that matched my pace, so we all stuck together. There were so many times during the first half of the hike when I thought about how much easier it would be to turn around and to walk back to the bus. But every time I started to think about going back, I made myself take another step up towards the top. When we were half way up the mountain, the 5 of us stopped and turned around to look at the view. We sat there for a few minutes drinking water and talking about how tired we were. One of my new friends noticed my scar and asked me if I had had heart surgery before. I told her yes, and we talked about it for a few minutes before we picked up our backpacks and started hiking again. From that moment we changed from 5 girls hiking a mountain together to 5 friends climbing Table Mountain. We started talking about life, what our friends were like back home, how sore our legs were, our hobbies, our goals, where we would take our next break and anything else that came to mind. We sang songs, rapped some Black Eyed Peas, stood under dripping water to cool off and occasionally watched each other slip and then laugh about how bad it could have been. By this point, we were three quarters up the mountain and I wasn’t even thinking about my heart anymore. I was thinking about how tired my thighs were and with every step up I thought they were going to give out. The top was so close that we could see the break in the elevation when the mountain leveled out at the top. We began cheering and singing more and as we crossed the finish line we all stood in complete awe and amazement at the view in front of us. I’m sure we all had our own reasons to be amazed. I could not stop thinking about how impossible it felt that I had just climbed 3,500 feet into the clouds and was now standing on top of Table Mountain staring out at the ocean. I’ll never forget the way I felt standing at the top with my new friends and my newfound confidence in myself.